I have the ability to potentially DOUBLE the sales of Bowers Plumbing in the next 12–18 months. That might sound insane, but I truly believe it is possible. Every business owner is adapting to how radically marketing has changed. We live in a world where people use their phones for just about everything. If you don’t rank well on Google, you might as well not even exist to most of your customers. Study on which results get the most clicks. Before I share those three things, I’d like to quickly share with you who I am. My name is Matthew Rupp (my story) and I have helped local companies right here in Wichita like Patton Termite & Pest, Cambridge Family Dentistry, Auto Craft, Midwest KIA, and Kansas Controls see improved rankings, increased traffic, and higher conversions (your phone ringing). My background isn’t in “web work” but in running a local service business just like my clients. I figured out how to make my business back then, Big Sky Party Rentals, a party rental company right here in Wichita, crush it on Google and used that knowledge to begin helping others do the same. Because of my experience, I speak your language and understand how to help. OK, let’s get to the good stuff. 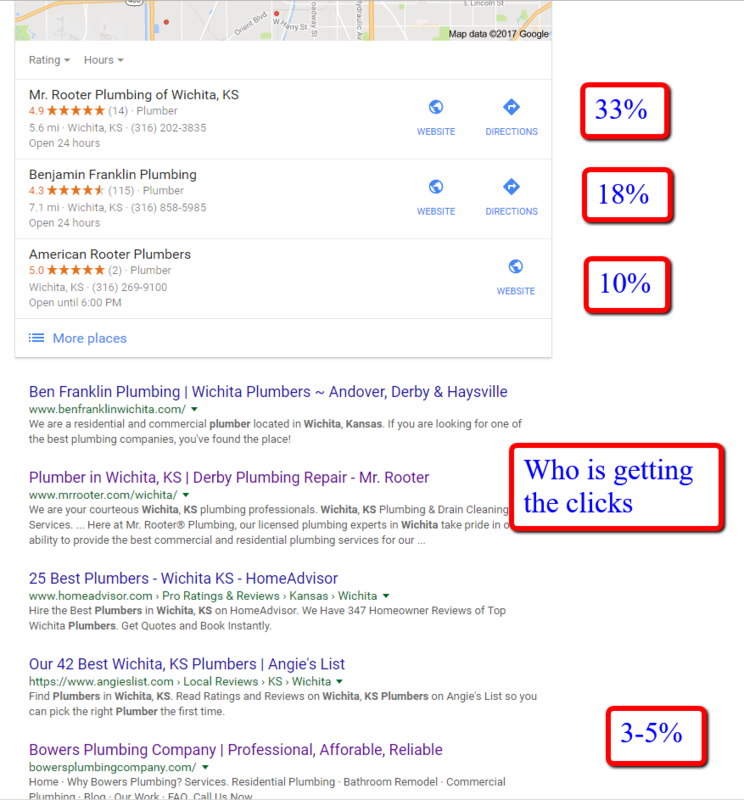 I promised to share 3 ways for Bowers Plumbing (or any plumbing company) to increase its presence on Google and dominate search results. Google doesn’t rank websites, they rank pages. There is NO confusion regarding what this page is ABOUT, what it should rank for. 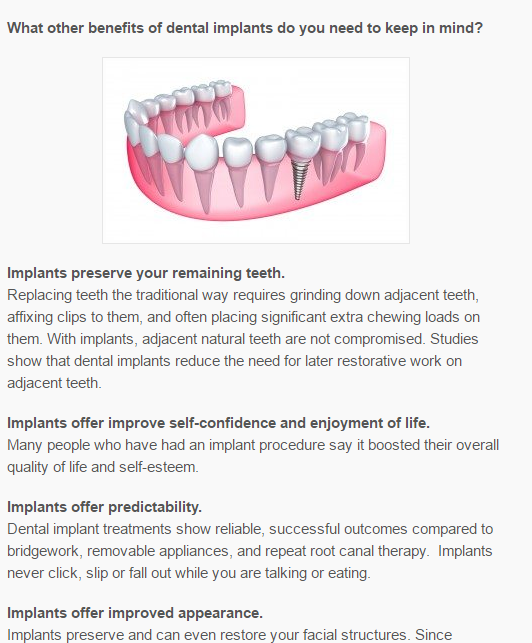 This page is ALL about dental implants from top to bottom. I could go on and on, but if you looked at that page you’ll “get it.” From the testimonials, the video, the images there is absolutely NO doubt to Google what this page is ABOUT. I challenge you to look at your website and ask yourself the same question. With the residential plumbing page on the Bowers site, for example, can you tell me what this page is ABOUT? What kind of residential customers? Sometimes it can be helpful to consider who Google’s target customers are. They are the billion people who use their search engine every day—not the advertisers, and not the businesses that they rank. Google’s goal is to provide the BEST possible results based on what the customer searches for. Usually people search for services to meet specific needs or solve a problem. It makes sense, therefore, that a page that mentions sewer ejectors, sump pumps, garbage disposals, water heater repair, and a dozen other items will not qualify as the best result for residential plumbing according to Google. Even though these additional services are related, Google’s job is to generate results that best correspond to the customer’s specific search. Think of it this way: You wouldn’t refer your lawn guy to a friend to paint a house, build a brick mailbox, or put up a fence just because all three jobs have to do with your front yard, right? I wouldn’t. It’s the same thing with Google. I put my heart and soul into growing my clients’ online presence. Shoot me an email to set up a time to meet. Without question, the single most important page of ALL my clients’ websites is their ABOUT page. In every website we work on, we install a small piece of code that allows us to see a heatmap showing what exactly gets clicked on (and what doesn’t). From a pest control company to a body shop, a dentist to a home builder, the page that gets the MOST clicks is the “about” page. It’s hard to overstate the importance of this page and its content. People are searching for businesses they can trust, reputable and honest businesses that have real experience and know what they are doing. Customers want to hire people who will treat them fairly and whom they can trust in their home. Make it easy for them to see YOU are that choice. 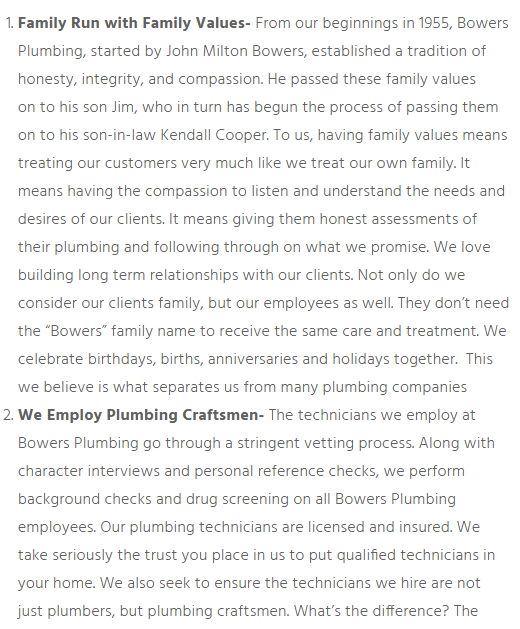 I would change “why Bowers plumbing” to “About Bowers.” When I saw the page title, I expected to see 6–8 cookie-cutter reasons to choose Bowers. I am certain the same page would get more traffic if it were labeled “About” instead. But that content gets lost in the cookie-cutter images and the thick blocks of text—it’s like burying gold right below the surface. Very few people will take the time to read all of the text. While we are on the subject of website navigation, it’s important to note that there is no “contact” page. This can frustrate and even deter potential customers. If they are uncertain of how to reach the company, they may not spend the time trying to figure it out and instead go with a company that’s easier to contact. Simply by adding a page called “Contact Us,” Bowers could gain customers whose business they would otherwise lose. There is also a button to request a service call, but it took me to a broken page, so it’s useless to the customer. It’s great that there is a blog, but it doesn’t deserve a spot in the navigation on the homepage. The section “Our work” should be called “Videos.” People don’t care about examples of the company’s work nearly as much as they care about videos! It’s refreshing to see original content that isn’t the same cookie-cutter garbage found in most websites. My advice would be to make a series of short videos similar to what they have now but based around specific keywords that people search for ALL the time. Some of these videos are getting incredible traffic. This is a superb and valuable part of their business. These videos are bringing in 50–60 thousand visits for a local plumbing company AND all the videos are two years old! My guess is they stopped making videos because their business has grown so much that they don’t have time anymore! 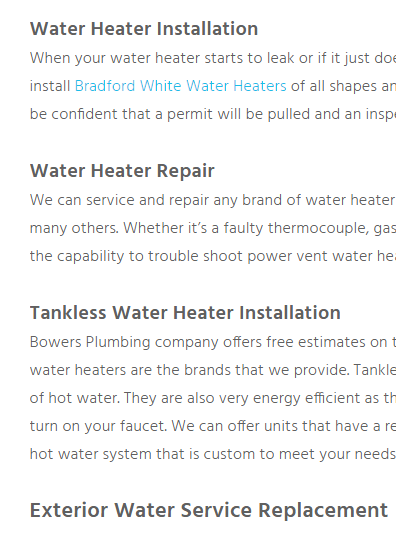 Those are my “BIG THREE” for how Bowers Plumbing could take the lead from other successful companies and start on the path to dominating Google. Most likely, these three things won’t be enough by themselves. They WILL help, but success will also require time and work. But the rewards are immense. 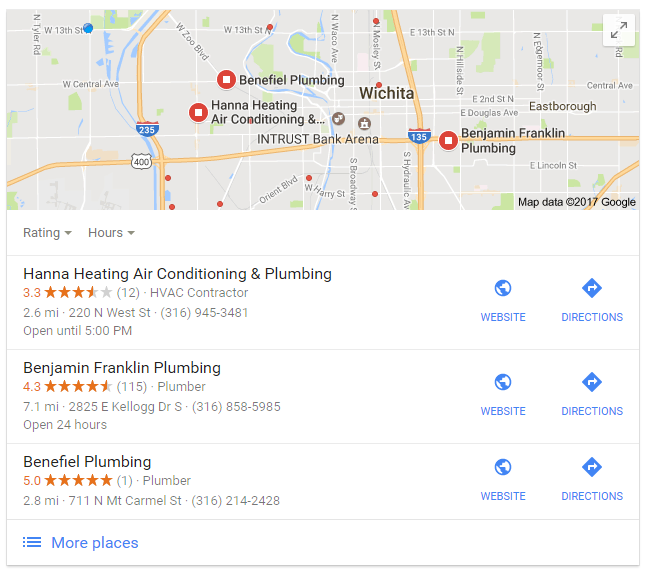 If you are with Bowers (or another plumbing company) and would like to learn an additional LIST of ways to crush it on Google (right here in Wichita), you can reach me at 316.285.0729 or shoot me an email at localseo@matthewrupp.com.